I am here to tell you you should never buy store bought bread crumbs again. It is so simple to make them at home. Here is my super simple way to make them whenever you need them. If I am making something that needs bread crumbs here is what I do. Just stay some bread heels and pop them in the toaster. Once toasted I just break them up and put them into my mini food processor and blend them up. You can add seasonings at this point if you want them seasoned. Wah-lah! That is it. 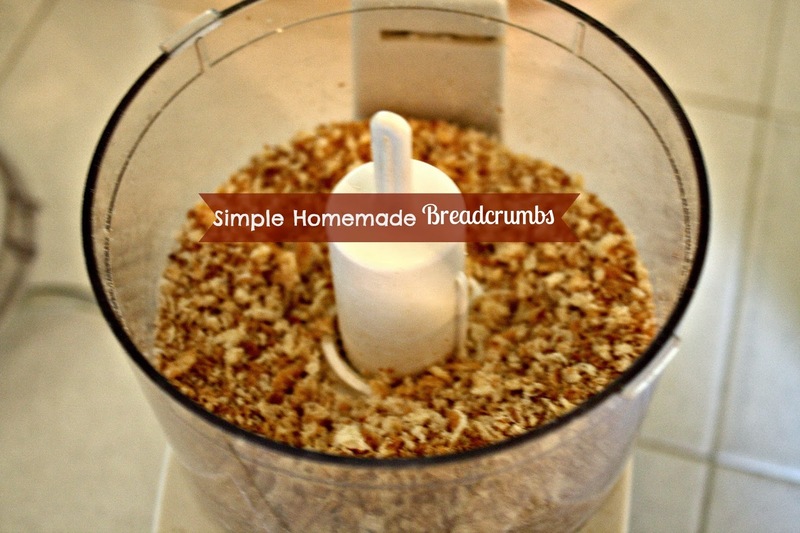 You have homemade bread crumbs. It is that simple. This is wonderful idea, Elaine! Thanks so much for sharing with us. Hope you're having a lovely weekend. We do this all the time - we also add whatever we have laying around in open bags - crackers, potato chips, Fritos, nacho chips - you'd be amazed at the nice flavors you get by adding that stuff, plus nothing ever goes to waste. Whatever I don't use I just store in a Tupperware container for next time. I rarely buy breadcrumbs at all anymore. I do fresh crumbs too which are good on fish and put it in a container in the freezer. Do the same way just don't toast. I knew I should've been saving all those heels my kids don't like to eat. Now I won't feel guilty for being wasteful! Thanks for sharing! Brilliant idea because I buy them and never use the whole can and throw too many crumbs away! I've been doing it that way for years and years. So fast and simple! I know about this tip, but still I buy them. Making your own does save a bit on the grocery bill though. I have made my own croutons too, they are relatively easy to make and better than the store bought ones. Great easy way!! getting ready for Thanksgiving dressing! My sister and I just had this conversation. How did we get lulled into buying breadcrumbs when we have bread and a toaster? Great post.